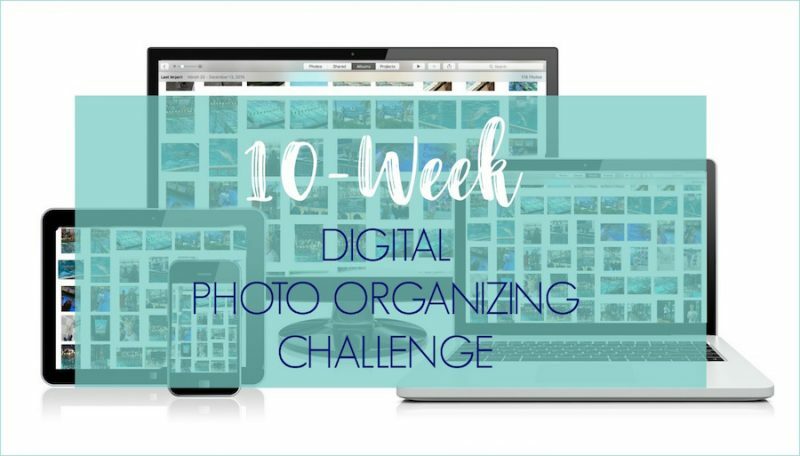 I created this 10-week Digital Photo Organizing Challenge to provide motivation and a blueprint for completing what is typically a daunting organizing project. I want you to reap the benefits of an organized digital photo collection! Even the most organized among us struggles with disorganization when it comes to photos. Our digital photo collections are particularly messy, since we take so many photos from so many different devices, without ever giving much thought to what images we will keep, where we will store them, and how we will ever retrieve them if we need them. As a former APPO-certified photo organizer, I’ve helped many people bring order to their digital photo chaos. I’m super excited to help YOU as well! HOW DOES THE 10-WEEK DIGITAL PHOTO ORGANIZING CHALLENGE WORK? Every week for 10 weeks, we’ll tackle a specific step of the digital photo organizing process. At the end of the post, there will be a set of assignments to complete during the week as part of the photo organizing process. 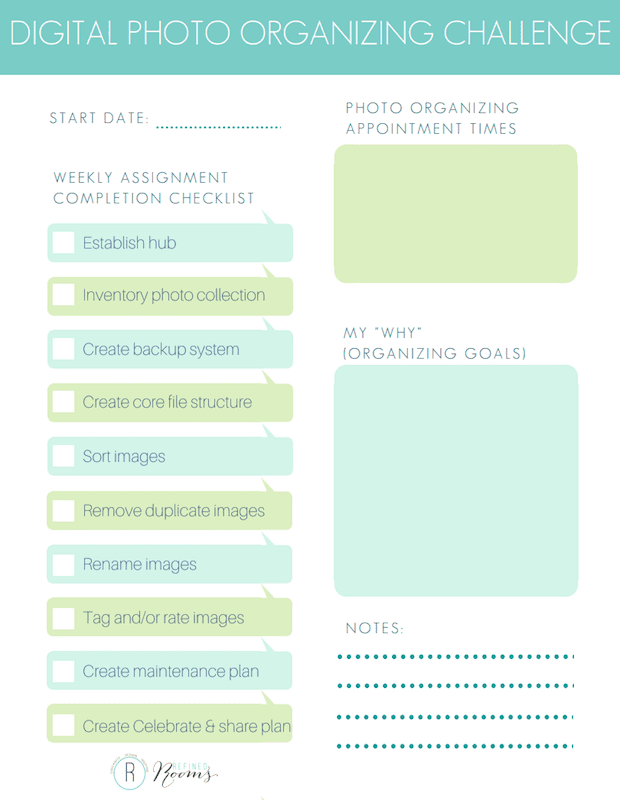 This time around, I’ll provide a printable To Do list you can use as a weekly guide. This challenge does require you to complete the assignments in the order in which they are assigned, as each set of tasks builds upon the previous ones. So, if you have a really busy week and aren’t able to complete the assignment, go ahead and complete it the following week, knowing that you’ll be a week behind. If it takes you longer than 10 weeks to complete the Challenge, no worries. You’ll still reap the benefits of an organized photo collection that you can fully enjoy when you get to the end of the process! HOW DO I PREPARE FOR THE 10 WEEK DIGITAL PHOTO ORGANIZING CHALLENGE? As with any organizing challenge, there are three things that you can do to set yourself up for success. In order to sustain your motivation throughout the course of any organizing challenge, it’s critical that you focus on the reasons why you’re doing it in the first place. What are your goals for the end of the Digital Photo Organizing Challenge? For some of you, it might be the peace of mind knowing that you’ve finally backed up your digital photo collection . For others, the goal might be to spend less time searching for important images for that photo book/gift that you want to create. Write down your vision for your newly organized digital photo collection at the end of the challenge. Refer to it when you feel your motivation waning. Find a friend to do the challenge along with you. You will be so much more likely to follow through with the challenge assignments if you have an accountability partner who will be checking in regularly to see your progress. Challenge buddies can serve to encourage one another, and provide another perspective on how to approach an organizing challenge. It’s more fun than taking on the challenge alone! You can also find support and encouragement from others who are going through the Challenge in my private Facebook group. Join here! As with all organizing/decluttering tasks, you’ll need to make a firm commitment to making the weekly photo organizing assignments priority this fall. My best advice for your is to plan appointments in your calendar each week in order to complete the challenge assignments. The length and number of appointments may vary, depending on the size and the current state of your photo collection. Treat those appointments as sacred. Want to make sure you don’t miss a Challenge assignment? Sign up at the end of this post below to have the weekly Digital Photo Organizing Challenge assignments sent directly to your email inbox. Let me know if you’ re joining me in the Digital Photo Organizing Challenge this time around! Get ready for your first assignment! Thanks for joining the Digital Photo Organizing Challenge! Check your inbox each Friday for your Challenge assignments. ~ Happy Photo Organizing! Is this current? I just found the article today -and I DEFINITELY need to organize my digital photos. I’m running out of cloud space everywhere! Hi LouAnn! The Challenge is self-paced. If you subscribe to my community/mailing list (sign up box at end of post), you’ll receive weekly Challenge assignments delivered to your inbox. Welcome aboard! Just finding you today through Pinterest. Most of my photos are on my phone or on CDs. I’ve been working on reconstruction of an old album for my Mom so I’ve scanned some very old photos to CD. Is that a good way to keep the heritage photos? When Is the 10 week photo organizing challenge going to start again? Will I be able to do the challenge, not being very computer tech oriented ? Thanks in advance. Unfortunately, CDs have become an outdated form of backup technology. Scanning to an external hard drive (as well as a secondary cloud-based storage option) would be the approach I would take (see my post about recommended back up strategies here. You can sign up at the bottom of this post to receive the weekly challenges in your email inbox. Going through the process does require a certain comfort level with technology. If you find yourself overwhelmed, you can always outsource your digital photo organizing project by hiring an expert — go to APPO.org to find one in your area. Good luck! This is super! I’ve gone through my photos and taken out all the duplicates, and to be honest, I’ve thrown a lot out. I realized that I didn’t need to keep some of the hard copy of photos. More and more I’m realizing that the memories are carried in my heart and I don’t need the photo. But there is a stack that I need to scan or something in order to get organized. I don’t want to keep them in albums since I’m trying to declutter and minimize my belongings. Visiting from Monday Madness. Stick with me over these next 10 weeks, and I’ll touch upon the issue of scanning the print photos. I typically recommend tackling that piece after we get the digital photos organized. Thanks for stopping by! As a new APPO member I will be following this closely! Thanks for stopping by, and welcome to APPO! Glad to have you along the ride for the Challenge! There is such a wealth of knowledge to tap into among the APPO membership. You’ll be very happy with your decision to become a member! I’ve tried many methods to organize my thousands of digital photos, which are now on multiple hard drives as I remove them from my laptop. This may be just what I need. So glad you found the Challenge…you are just the type of person that I designed it for! Hoping to see you and hear about your successes in the coming weeks. Welcome!